Noko starts you off with a 15 minutes default minimum billing increment for all projects. That means if you enter 3, 5, or 8 minutes, your time entry will be rounded up to 15 minutes. Minimum billing increments are standard for many industries, especially design, programming & other creative services. They help reflect the actual cost of changing from one very short task to another, and correctly compensate you for many small interruptions! That's why they're a standard for many industries, for example 15 minutes for creatives or 6 minutes for lawyers (Why 6 minutes? That's a 1/10th of an hour!). We highly recommend using billing increments in order to get a better balanced picture of time you actually spend working. 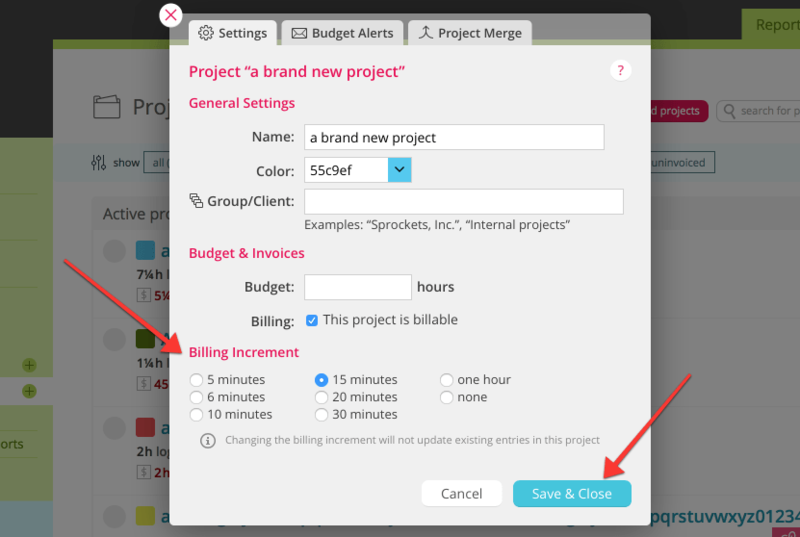 Noko will automatically assign new projects a default billing increment of 15 minutes. Account Owners can change the default billing increment for all new projects to whatever billing increment fits their team's workflow best. To set an account wide billing increment follow these steps. Scroll down and click the radio button for the billing increment you like. If you'd like to change the billing increment for all currently active projects, check the "Apply the new increment to all active projects" box. All new projects in your account will automatically have the custom billing increment you've chosen. If you check "Apply the new increment to all active projects", all active projects will also have the custom billing increment. If a the default billing increment doesn't fit your workflow for a specific project (for example, a client wants strictly hourly billing), you can configure individual projects to have different increments. Go to Projects in the green navigation sidebar. Hover over the project you want to confiugure and click settings. From now on, your project will now round to the billing increment you chose. Existing entries for the project are not affected. Changing the billing increment in a project will not alter existing entries in that project in any way.